Serene is the current Editor at The Inkdrop – a student led print & online publication for Brisbane State High School. When asked about how it all started, Serene recalls hearing about the mysterious publication when she was in year 8, but unfortunately it stopped after only it’s 4th issue. When she was reminded of the initiative via her Student Council meetings two years later, Serene quickly approached the schools Principle and his PA, requesting to take charge of the relaunch. During the process to launch the aptly named ‘Phoenix Edition’, Serene worked closely with a permanent team of writers, editors and graphic designers but filled the blanks with a number of student submissions. 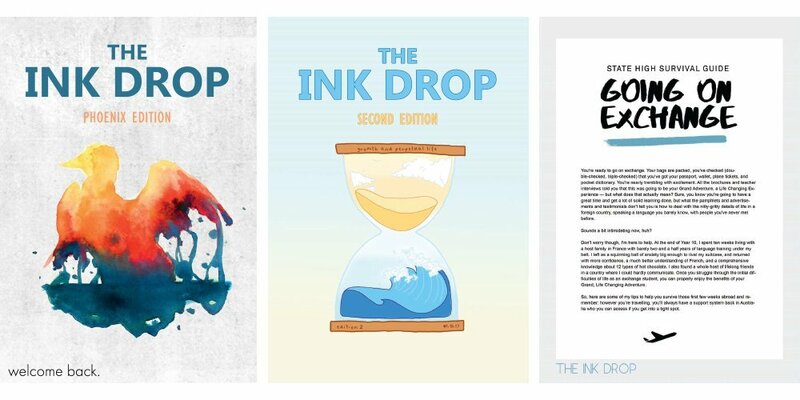 From the get go, with the intention to see The Inkdrop continue for years to come, Serene was adamant to include a wide variety of submissions, especially from younger members and grades. This deliberate ploy was to ensure that when the time came to pass the baton, there were a number of skilled and enthused individuals to continue their work. Beyond the scope of longevity however, Serene also believes it’s important to provide the right encouragement and recognition for these younger members in order for their confidence to be boosted and their work validated. In her spare time, when she isn’t with her beautiful dog, Serene participates in sailing and martial arts where she finds she is able to unwind and maintain balance between her school and personal life. After starting sailing when she first moved from China, Serene quickly fell in love with the sport and now enjoys coaching younger participants as an instructor for her local club. She believes it’s important to help younger students find an outlet outside of the classroom in order to avoid having school become all-consuming and unhealthy. In addition to her continued work with The Inkdrop and sailing, Serene also has passions to become a doctor. Currently she is already studying Chemistry, Biology and two types of Maths and plans to study a unit (or two) at QUT next year, as part of their START program. Clearly, Serene has nailed the juggling schedule, which is unsurprising giving her determined streak. All in all, during our conversation with Serene, it became clear that despite having no intentions to become a leader or mentor, throughout her work on The Inkdrop and as a sailing instructor, Serene has uncovered a desire to encourage and help others. Despite admitting it was challenging at first, she knew she had to “step up” and manage not only processes and timelines but also people – and in the end you only have to look at the results to know, she no only handled her newfound role well, but that she naturally enjoyed it. When you hear Serene speak about those younger than her and how she enjoys seeing them succeed you know you have a great future leader (and doctor!) in the midst. We can’t wait to see what’s next! Rika Usami, renown Japanese kata champion and idol. Her performance at the 2012 World Championships in Paris invoked a 5-minute standing ovation from a 12,000 strong crowd. Rika’s skill, passion, and dedication are insanely aspiring, and her physical control is something I dream of achieving. Following a slightly upsetting interaction with a friend, my dad asked me two questions: is it important, and does it matter? These two questions have become my frameworks for ‘picking battles’ as it were, questioning both the importance of the overarching issue being highlighted (eg. marriage equality, sexism, etc.) and of the individual case in point (eg. my friend wearing a Trump supporter cap ‘ironically’ on Halloween). As someone who suffers through small talk, this has helped me to guide productive discussions/avoid nuclear fallouts with loved ones. I’m not bad at dancing – a surprised classmate complimented me at my school’s semi-formal. I suppose the surprise is warranted, as walking into clearly visible objects is a specialty of mine and my coordination (or lack of) is a long running joke. My German Shepherd. He’s almost ten, and is lovingly referred to as the German Bathmat (although I prefer to call him The Bear). He’s been with me since we moved to Australia, and it’s as if his one purpose in life is to make me smile; he’s too good at it. Music helps me wake up, get work done, and wind down. On a bad day, it’s my escape. In five years, I’ll still probably be studying – the bane of aspirations in medicine. Medicine, along with the necessary specialisation studies afterwards, is insanely competitive, so next year will be crucial in building a strong foundation for university. I know I’ll be advancing my karate skills, having achieved black belt. I look forward to competing more and continuing to reap the stress-relieving benefits of the sport. Putting in the time and effort now will be worth it in the future. I want to write more, read more, do more. That’ll be my next five years.